Vintage From Paul is delighted to offer these classic Wood & Sons Blue Boy & Pinky Girl Plates. This plate is stunning. Red roses and blue flowers outline the plate intermittenly with some gold roses. Pinky Girl and Blue Boy are the center of attention as they are surrounded by a vine of gold. The rim of the plate also adorns this same gold. The white space makes for a delicate and clean design. Very victorian and made by Wood and Sons for Avon. 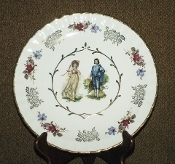 The Wood & Sons Blue Boy & Pinky Girl Plates measure a generous 10 inches in diameter. Each of the available Plate is in pristine condition. There are no defects or flaws noted. The colors are vibrant, the graphics crisp. The Plates are hallmarked in black with; "Avon By Wood & Sons, Burslem England, Alpine White Ironstone".